The Fabric Mill makes a variety of shades perfect for any décor. Our fabric shade options include: Flat Fold / Classic Roman, Soft-Fold Roman, Relaxed Roman, London, Balloon, and Austrian to name a few. Shades can be mounted either inside or outside the molding depending on the structure of your window. Shades have the advantage of offering privacy and style whether the shade is all the way down or partially raised. We can fabricate shades for any shape window, such as oval and arched. Other options include black out lining for room darkness, choice of a clutch roller or spring loaded cordless shade. With your imagination and our experience, The Fabric Mill can create your house into your home. With our team of specialists, custom capabilities are endless. The Fabric Mill fabricates a variety of window treatments in the fabric and style of your choice. Best of all, we have our own workroom on the premises ensuring the highest quality at the lowest prices. 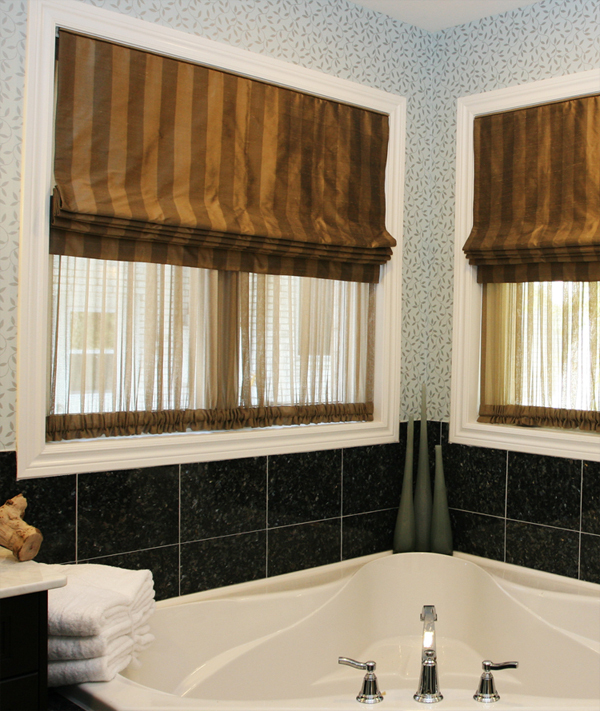 We custom make draperies, valances, cornices, swags, shades, and shower curtains in the fabric of your choice. In addition, we offer professional measuring and installation. We also have one of the best selections of decorative hardware with many styles and finishes.